Shirley is one of HOPE’s original volunteers. Marty and Ben Tennille shared their vision about HOPE with her church, Calvary Moravian, in early 2014. The opportunity to help Winston Salem’s food insecure children resonated with Shirley, and she began helping on Saturdays in February 2014, HOPE’s first full month of operation. 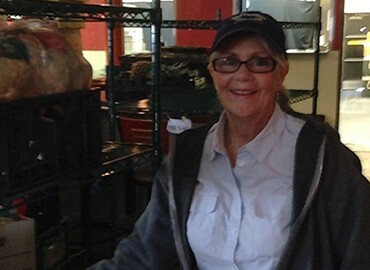 As a regular volunteer, Shirley can manage Saturday’s lunch making operation, which includes not only making hundreds of lunches on site with volunteers but also preparing ingredients and supplies for off site packing operations. She is also comfortable driving the HOPE van. After making lunches for many months, this HOPE hero wanted to see where the lunches go and meet the children. Shirley “gathered up the courage” to drive the van on Sunday afternoon and subsequently came to relish the chance to “get out into the community”. Volunteering at HOPE is an intergenerational experience for many families, including the extended Miller family. Shirley’s daughter, Jessica Childress, also heard the Tennilles’ call to help Winston’s hungry kids, and she frequently volunteers with her mother. She frequently brings her two young sons, Cashius 8 and Jackson 5, with her when she helps HOPE. Shirley thinks it is important to pass down to her granddaughters the importance of volunteering and helping others. She is usually accompanied by one of her granddaughters, Leah or Mia Grace. All are generous HOPE heroes! When Shirley coordinates the volunteers on Saturday mornings or drives the van on occasional Sundays, HOPE gets more than just an energetic, organized, smiling volunteer….we get three generations of her family plus lots of friends from her church. Shirley is a magnetic leader who makes volunteering the fun thing to do. She can handle anything! Her willingness to step up and make a difference in the lives of hungry children makes her a real hero.